Back-to-school season is an exciting time for both kids and parents. Prepare for the new year with a couple of DIY projects that will get you in the back-to-school spirit. 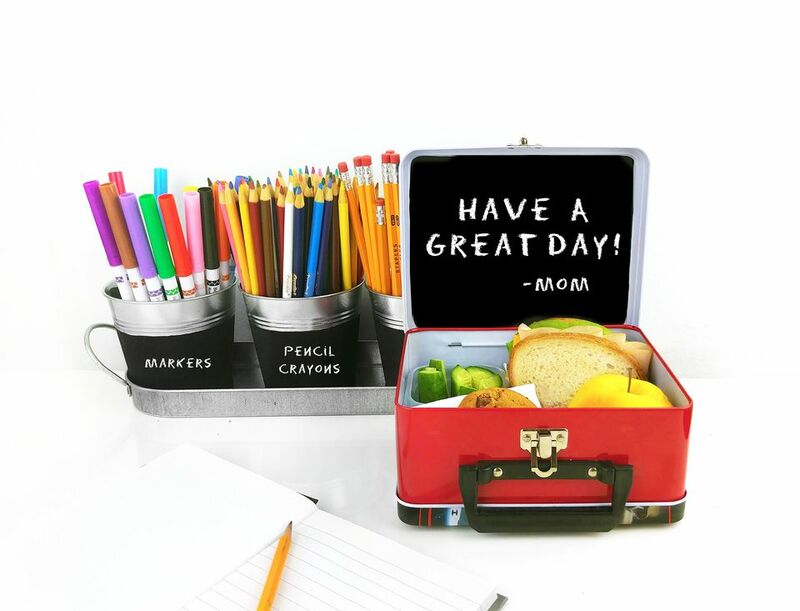 A chalkboard lunch box is a cute idea for moms who want send their children to school with a little extra love. DIY chalkboard school supply containers will make it easy to set up an organized homework station. These two projects are perfect for busy parents, as both take around 30 minutes to make. Customize your child's lunch box with a chalkboard–perfect for leaving notes after you finish packing their lunch every morning. Instead of giving your child small paper notes or reminders on their way to school, which can be easily lost, save paper, and write them a note they can't miss at lunch time. Next time your kid has a big test, leave them a surprise motivational note in their lunch. The blackboard is also a perfect place to write reminders or instructions on how long to reheat their meal. Before painting the lunchbox, clean the interior of the lid, and wipe it dry with a clean cloth. Protect your workspace with a drop cloth. Place the lunch box so that the lid is flat to make it easier to paint. Pour the paint into a small tray. Paint the inside lid of the lunch box with two or three coats of chalkboard paint, allowing the paint to dry between coats. Before writing on the chalkboard area, "season" the surface. You can do this by rolling a piece of chalk over the entire chalkboard surface. Next, erase all the chalk with a cloth, and the chalkboard is now ready to be written on. Do not skip this step, otherwise you will have problems with the chalk never fully erasing. Next time you pack your child's lunch, your new chalkboard lunchbox is ready to go! Leave a smile on your child's face with an encouraging "good luck" or a sweet sentiment to pair with their sandwich. Help your kids with their daily homework by setting up an organized homework station. Keep essential school supplies within easy reach with sorted containers on their desk. This setup will also help you see when they are running low on supplies. Best of all, as your child gets older and transitions from pencils to pens, the chalk labels can be rewritten. Before you begin painting, clean the exterior of the plant pots and dry them with a cloth. Protect your workspace by covering it with a drop cloth. Paint the small plant pots using chalkboard paint. Pour a small amount of chalkboard paint into a small container or tray. Using a foam paint brush, apply 2-3 coats of chalkboard paint. Allow the paint to dry between coats. Note: On the plant pots used in this particular tutorial, there was a small beveled edge 1/4" from the top of the pot. I was able to apply the paint freehand, following the beveled edge. If your plant pots do not have a beveled edge, stick masking tape around the top of the pot and paint under the tape. Prep the chalkboard pots by "seasoning" them. To do this, you will need to cover the chalkboard surface on all the pots with chalk. A simple way to do this is by rolling a piece of chalk over the pots. Use a cloth to wipe off the chalk. Do not skip this step, otherwise you will have problems with the chalk never fully erasing. Use a piece of chalk to label the containers with what you will store in them. Fill the containers with the school supplies, such as markers, pencils, or rulers. Place the school supplies on a table or desk in your home to set up a homework station for your child to use after school. This quick DIY can easily be adapted for adults too! Organize your craft room or office with some chalkboard storage containers.